Cerebral infarction. Coloured Magnetic Resonance Imaging (MRI) scan of the brain of a 75 year old man, showing a cerebral infarction. Smaller cerebral arteries are seen branching off larger arteries originating from the base of the brain. A blood haemorrhage (centre right, red/yellow ) with infarction (death of tissue) has occurred next to one cerebral artery. The cause was atheroma, the collection of fatty tissue on walls of blood vessels which weakens the arteries. Known as a cerebrovascular accident (CVA), it may result in a stroke. 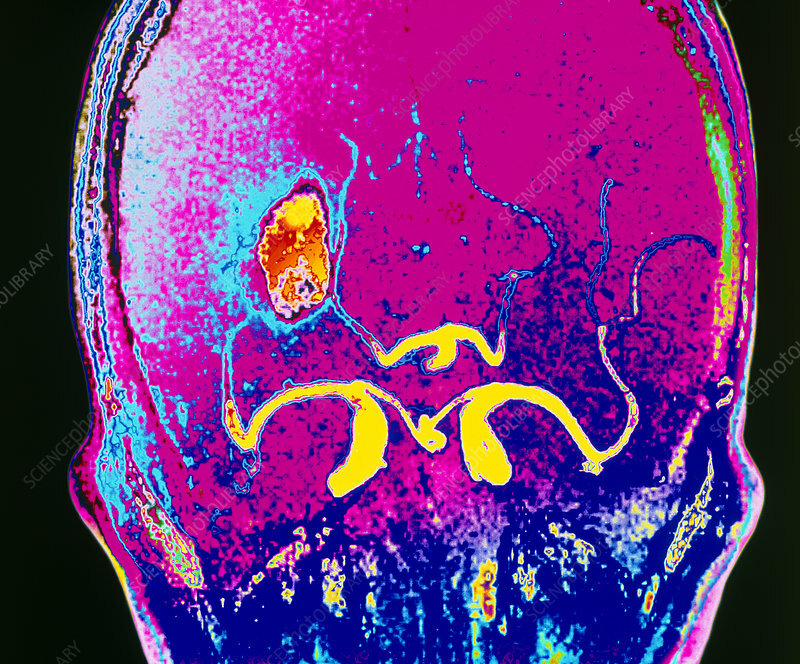 MRI shows up blood vessels without the need to inject a contrast medium into the blood.